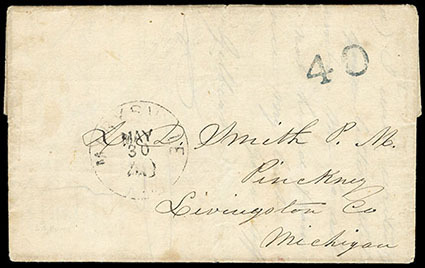 Marysville, Cal., May 30 / 40, large cds with integral rate on folded letter to the postmaster at Pinckney, Michigan, also large "40" rate handstamp in blue likely applied in Pinckney, letter (1½ pages) with personal content is from a farmer to his wife, which is strange because she is not the addressee, letter is datelined "Lapon's Ranch Molino Co. California, May 24th 1850", which is also strange because there was never a Molino County in California and this letter is necessarily and 1851 use given the postmark type and rate, letter mentions "our crops look fair at present, what success we shall have in disposing of them is yet in the future, which depends upon the amount of emigration to this country", minor corner wear, Very Fine. 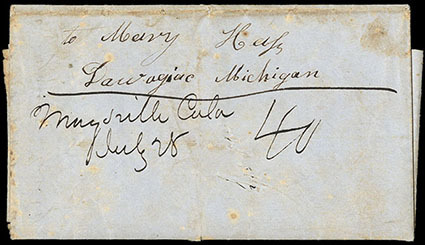 Marysville Cala, July 28, manuscript postmark and manuscript "40" rate marking on folded letter to Dowagiac, Michigan, letter (2½ pages) is headed "Marysville July the 4th 1850" and from miner to his daughter back home, letter discusses family matters and ends with prices current, in between the writer reports he and another man "arrived the 22th day of August… we worked together in the first mines a little while and then… we went up the Sacramento about 250 miles… we made about 800 dollars through the winter… we located provisions up the river… we have 2 teams and 10 pack mules… the water being by the melting of the snow so that we cannot work in the mines much 'til August", small scrapes between the postmark and rate marking, a bit soiled, bleach spots, Fine and very early for this town, just five Marysville manuscript postmarks are recorded. 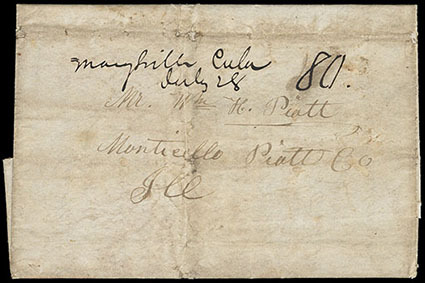 Marysville Cala, July 28, manuscript postmark (same date as the previous lot) and manuscript "80" rate marking on folded letter to Monticello, Illinois, letter (3 pages) is from a miner to his brother back home and datelined "June the 5th 1850, Sierra Nevada N Fork of N Yuba", letter is about family plans and includes prices current, the writer also mentions "The water is too high for us to do much yet 'tho we have taken four thousand dollars out of the bank in the last two months, we have not worked hard either… there is six of us in partnership, two sailors Tom and Bill clever fellows… Tom can beat the gals at cooking, we live about as well as you do at home… excuse the scribbling, my seat is a stone my desk the same", small holes on the fold lines and a bit soiled, Fine and rare, the only recorded Marysville manuscript postmark showing the 80¢ double rate. Marysville, Cal., Dec? ? 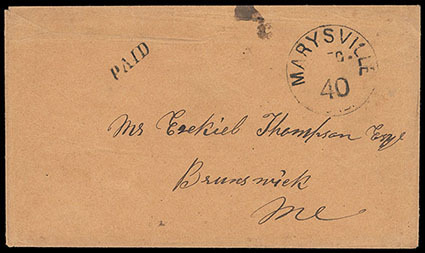 / 40, large cds with integral rate and straightline "Paid" handstamp on cover to Brunswick, Maine, undated but necessarily an 1850 use given the postmark type and rate, ink blot at top, Very Fine. 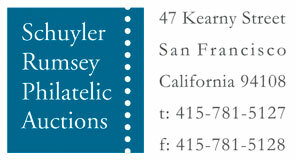 Marysville, Cal., two covers to the East Coast, both with large Marysville, Cal. cds with integral "40" rate, one with straightline "Paid" handstamp and "40 /proof" pencil notation, one is a rebacked cover front, other refolded with edge wear, Fine. Marysville, Cal., Mar 19 / 12½, large cds with integral rate on folded letter to San Francisco, letter (1½ pages) is from a man to a friend or business associate and datelined "March 15th, 51, Long Bar Yuba River California", the writer states "I have not worked over 10 days all winter" due to illness that he describes in detail and "There are a good many men to work on this Bar at present. None makes over 8 dollars per day on average. Many less. 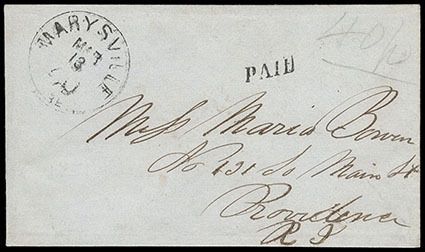 If you can I wish you would send me some money… send it by some express to Marysville", a couple small stains, Very Fine, just 3 examples of this postmark type showing the 12½¢ rate are recorded. 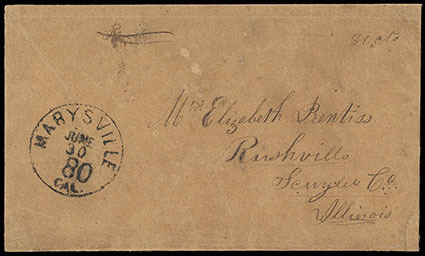 Marysville, Cal., June 30 / 80, large cds with integral rate on cover to Rushville, Illinois, also manuscript "Paid" and "80 cts" endorsements with "Paid" deleted, undated but necessarily an 1851 use given the postmark type and rate, cover restored with lining added and corners repointed, a couple bleach spots, card reinforcement inside, Very Fine appearance, the only recorded example of this postmark type showing the 80¢ double rate. This cover provides an appropriate close to this collection. 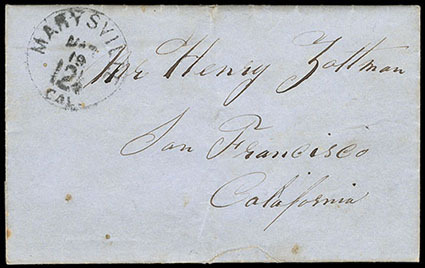 The cover was sent on the last day of the "40" rate period.